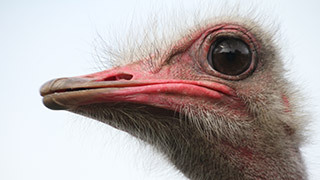 Ostriches are the largest extant bird species. They can't fly, but with their long legs, they can reach running speeds of up to 70 km/h. This bird is common in the African savannas and besides eating grass, fruit and seeds, they're known to occasionally feed on insect and small vertebrates.